Dynomax Super Turbo Muffler In/Out: 2"
Body Diameter: 3.25" x 7.75"
These Dynomax Super Turbo mufflers give the mellow rumble you like, plus they make more horsepower than a straight pipe! Their patented flow directors and large diameter internal tubes channel exhaust flow and eliminate turbulence. The fiberglass matting delivers a mellow, true performance sound, and all-aluminized construction keeps your Super Turbo looking good and working well for a long time. Each muffler is double wrapped or arc-welded (depending on application) for lasting performance. 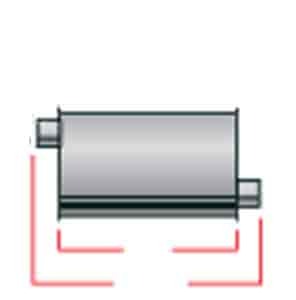 All universal mufflers flow in any direction (unless stated) to fit almost any custom application.